Forest Garden 7 x 7 Overlap Pressure Treated Apex Shed: This Forest Garden overlap pressure treated shed in a 7 x 7 size will give you plenty of outdoor storage space so that you can keep your garden tidy and clutter free. 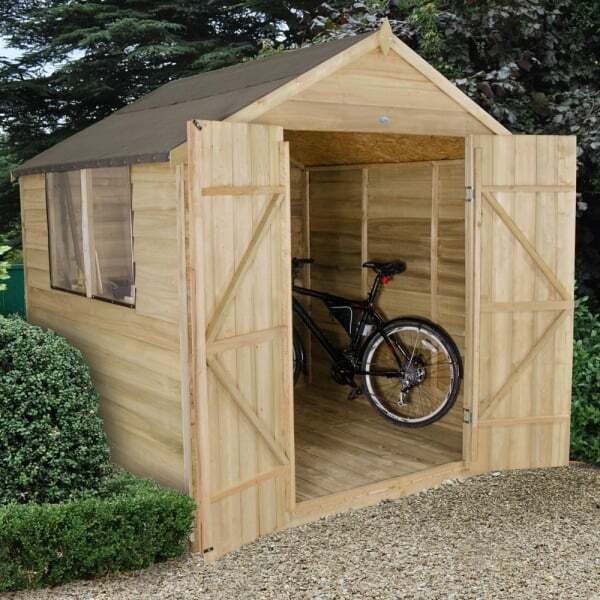 This shed is ideal for storing garden tools and equipment as the double door on the front of the building will allow plenty of space for getting in and out. The shed also has 2 windows to the side which will provide light into the shed, the glazing on the windows is polycarbonate to ensure that it will not go yellow or brittle over time and it is unbreakable so you will not need to worry about the children playing ball games in the garden. This wooden shed has a pressure treated boarded floor and OSB sheet material roof, the included shed felt will provide you with a waterproof covering to help protect the shed from the elements. This shed has a rough sawn finish to it and is an overlap design which allows for flexibility for the natural movement within the wood. This shed is delivered in easy to handle sections and is simple to assemble using the included instructions.